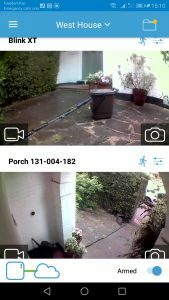 Last year Tested Technology reviewed the low cost and very adaptable Blink wireless security camera system. Favourably, overall. The two cameras we set up around the house were there, however, for no longer than the review period. The family objected to being under constant surveillance and the system had to be dismantled. It was no good explaining to them that the Blink system allows the cameras to be scheduled only to switch on at certain times. Or that the fact that all the footage goes up to the Cloud (which might land it in the USA) doesn’t necessarily mean we were all under constant scrutiny from Mr Trump’s NSA. On that latter point, admittedly, I had my own reservations. The scheduling option was handy but in practice not as useful as I’d hoped. A regular household where everyone leaves for work at 7.30am and comes home at 6.oopm might benefit from it. But ours doesn’t run on clockwork. A practical solution would be a system that was able to detect the presence of known occupants (by their phones’ MAC addresses, perhaps) and only operate when they were all away. Two important developments have happened since that last review. They haven’t addressed the two issues above (the Cloud and the rigidity of scheduling) but they’re advances that have sent me back to re-evaluate the Blink system. Most importantly, Blink has been bought up by Amazon. 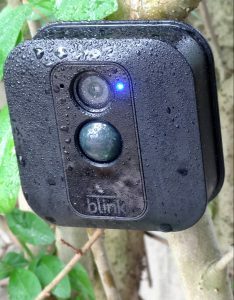 Secondly (but more relevant to this review) an external, waterproof version of the Blink camera, the Blink XT, has been added to the inventory. I’ve set up the XT in the front garden, where it keeps an eye on our front door. No objections from the family so far. IT TOOK NO TIME AT ALL to reimplement the original set up. 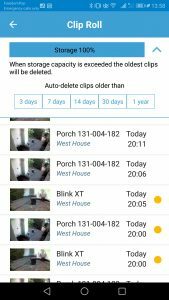 Once I’d connected up the USB power supply to the sync module that centrally controls the cameras, I installed the pair of lithium AA batteries that come bundled with the Blink XT and downloaded the Blink app to my Android phone. The Blink XT is sold without the Sync Module—I used the one from my previous review. 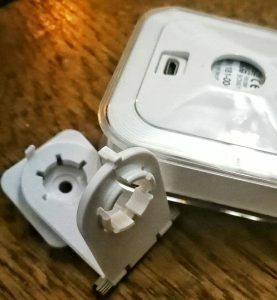 The Android Blink app walked me through connecting the new camera to the system—I only needed to register its serial number and check that it was connecting to the Sync Module and to my WiFi network. 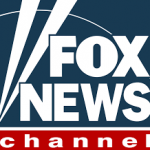 To be clear, these are two different wireless links: as well as the conventional 2.4GHz WiFi link used for streaming multimedia, the Sync Module exchanges control metadata with the cameras by way of a second, proprietary wireless channel. The claim of 2 year battery life is based on the use of disposable Lithium batteries, which come at a (slight) premium price (at the time of writing you can get a set of four from Amazon for around £6.50). Of course, it will depend on how long your clips are and how often, and the extent to which you use illumination. The app will warn you if it detects heavy use that will significantly shorten battery life. You’re probably wondering, as I did, why both are needed. The control channel has to be always open, but can be narrow bandwidth and low power. Which means that the WiFi link can be economically hibernated when not in use. This is the secret of the claimed two year life for the pair of AA batteries. So the cameras will need to be positioned within range of both your WiFi access point and the Sync Module. The app will show, for each camera, the strength of each of these connections. To cover a large property it might be necessary to install additional WiFi access points and/or Sync Modules. But for the purpose of this present review I’ve confined myself to running just two cameras: one of the original (indoor) Blinks, installed outside the front door of Bidmead Towers under cover of the porch; and the new (outdoor) Blink XT, screwed into the privet hedge, watching the porch from the street end of the front garden. I’ve added a third (original indoor) Blink keeping an eye on our backyard from under the cover of an archway. This is the most distant from the Sync Module, about 9 meters through two solid brick walls. The Android app shows the wireless link to the Sync Module as problematic, but it seems to be working fine. What Makes the Blink XT Different? I’m happy about incorporating the Blink XT into my privet hedge because unlike last year’s white indoor Blinks, the manufacturers assure me this one is IP65 rated. Broadly, this means “weatherproof”. Technically, it tells me that the casing is impervious to dust (the “6” part of the rating) and can withstand a downpour of rain (the “5” part). “IP” stands for “ingress protection” against solids and liquids. The lower your resolution, of course, the longer the batteries will last. The advantage of the highest resolution kicks in when you have to blow up a shot to identify an intruder. But with an outdoor camera even high resolution can fail you if the camera is having to shoot through a lens blurred with rain or dust. The Blink XT offers no protection against that. Note that this isn’t “waterproof”. The rating certifies that you can drench the Blink XT with a jet of water at a rate of 12.5 litres/minute from a distance of 3 metres for at least 15 minutes. You can’t drop it in the pond and expect it to survive. And in heavy monsoon weather it would be taking its chances. The second difference is that the previous bright white lamp has been replaced by an infra-red illuminator. This gives excellent night coverage, in monochrome, without startling any interloper (although the blue recording alert LED will always light up as on the earlier model—this seems to be a statutory requirement). The third improvement is that the new Blink XTs are capable of recording in full HD (1080p) instead of the previous limit of 720p. The app calls this “Enhanced” and gives you the option to dial this down to “Best” (720p) or even “Saver”, which knocks the display resolution down to 640×360. I’ve used the original Blink to illustrate the mount as white shows the details better. The Black XT version is identical apart from the colour. The setup, that is. Mostly because there’s no wiring to worry about, you can stick these things just about anywhere. The XT uses the same simple mounting system as the original Blinks, a plastic component with a screw-adjustable friction hinge. One arm of the hinge is clipped into a small mounting bracket with a central screw hole, relative to which the hinge can be rotated through 360º. The other arm has an identical rotating arrangement that clips into the back of the camera. Both rotations are sufficiently friction-constrained to keep the mounted camera in whatever position you choose. The app allows you to take a test still shot to check the coverage of the camera, which makes it a breeze to position accurately. With the original white Blink camera screwed into position under the front porch and the new Blink XT exposed to the weather in the privet hedge, I had the comings and goings of visitors completely covered. Initially, I left the cameras constantly armed, ready to take 60 second clips any time they detected movement. This turned out to be a mistake—at least if I was going to get the full 2 years from the lithium batteries. I started stacking up clips at a rate of about five an hour and the app warned me I was eating batteries fast. As I mentioned in the intro, the Blink system allows for scheduling. I settled on simply arranging for both cameras to be put on hold for eleven hours out of the 24. I also made sure to use the self-explanatory “End Clip early if motion stops” option on both cameras and dropped the intensity of the IR and white light illumination on the Blink XT and the Blink respectively. The porch and the hedge Blinks faithfully recorded the arrival of our Daily Telegraph at around 5:30am each morning, along with the regular comings and goings of the household and the occasional Amazon delivery. But they also nailed a nocturnal miscreant we’d been trying to track down for some time. Not a burglar, but a regular opener of the locked food disposal bin, responsible on several occasions for scattering its contents all over the path to our front door. A clever animal who had discovered the secret of swinging the locking handle right over the top of the bin before attempting to open the lid. A fox. 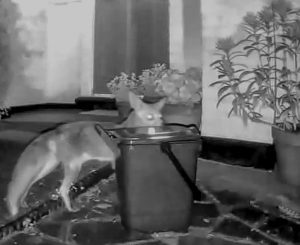 Thanks to the Blink XT’s night vision I was able to analyse exactly how the animal had learned to grip the side of the handle with its teeth, shake it over to the other side of the bin and then tip the bin over to rummage through its contents. To outsmart the creature I’m now going to have to figure out a way of locking the locking handle. The Blink Cloud service allows each system storage for a total of 7,200 seconds of video, which amounts to 1,440 events if you accept the default length of each clip, which is 5 seconds. I’ve tended to the maximum clip length of 60 seconds and set the option to terminate the clip when movement stops. Your Cloud storage is a FIFO buffer (first in first out), so by default once it’s reached the limit your oldest clips start to be overwritten. The app also gives you the option to auto delete clips according to their age, although it was hard to see the advantage of this. While the clips are in the buffer, any you want to keep can very easily be downloaded into your Android or iOS device. Downloading has to be per clip—for some reason the app omits the ability to batch download, although it will let you batch delete. Not a lot. It’s well-priced, dead easy to install with a very low maintenance cost. With a free subscription to the Cloud service, the only outlay is the replaceable batteries. The first thing I missed, though, was direct control over the cameras. Yes, the app lets you take still shots—for example, to help position a camera during setup—but these don’t go to the Cloud and can only be saved by taking a screenshot of your phone or tablet. The same is true of the short clips you can initiate direct from the app. The only data arriving in the Cloud (and so recoverable after the event) are clips resulting from the motion sensors. An important corollary of this is that the Blink system isn’t capable of live surveillance. Footage of the Amazon delivery arriving at my door has to be recorded on the camera and then be transferred through my WiFi access point up to the Cloud. Once that’s done—and it can take up to a couple of minutes—the app on my phone will trigger an alert. This is a direct consequence of the design decision to keep the system wireless-connected but low-powered. It’s a fair enough trade-off. Unlike more sophisticated (and much more expensive) surveillance systems, there’s no way of marking out areas of the frame you don’t want to respond to motion. If your back door cat-flap is in the frame you’ll waste footage every time the cat comes home or goes out for a walk. For the same reason, you’ll have to position outdoor Blink XTs so that no wind-blown leaves are directly in the frame. Even with these precautions, I did find my Cloud buffer tended to include the odd 60 second shot with no visible movement. This may have been due to the lag—I would guess—between any initiating movement and the moment the camera starts to roll. A cat moving in and out of a corner of the frame could start the camera without actually featuring in the movie. But that doesn’t explain why the camera, set to stop rolling when no further movement is detected, occasionally continued to run for the full 60 seconds I’d chosen as the max. Another puzzling quirk that turned up from time to time was an alert over the Android notification system telling me that the schedule disarm had failed. However, on checking, I’d discover that the system was indeed disarmed. Was this perhaps a function of the weak sync connection to the backyard Blink? It wasn’t clear whether Blink was misreporting, or whether it had been repeatedly trying the disarm and eventually succeeding. In the latter case I would expect it to file a notification reporting success. Reviewing the Blink system here and back in April of last year has left Tested Technology with a total of four cameras, three of them currently in use, an active Sync Module and a second Sync Module as spare*. We’re grateful to Blink for the donation, but I hope you’ll agree that we’ve kept this review objective. * Following this review the installed cameras will stay in place this time, for long term testing with the approval of the family. To set up a Blink system you’ll need a local WiFi network, and, as a minimum, the single-camera starter kit from Amazon, one white indoor camera and a Sync Module. This costs £130 (I don’t know why vendors still think £129.99 fools anybody these days). Additional indoor Blinks are £100 each, but if you know from the start you’ll be using more than one camera, you’ll get a better deal with the three-camera indoor system at £270. The outdoor Blink XTs are more expensive at £150 each or £240 if you go for the two-camera Blink XT deal, which also includes the Sync Unit.